The crisis with painkiller abuse affects older adults for many reasons. For one, aging brings on more aches and pains. It seems every day we read headlines about the increasing use and abuse of opioids—strong painkillers such as OxyContin, Percocet and Vicodin. They are often prescribed after surgery to relieve severe pain or for chronic conditions such as back pain. According to the Centers for Disease Control and Prevention, more than 19,000 Americans died from prescription opioid overdoses in 2014. While we might picture the typical opioid addict as a young adult slumped over in a vacant doorway, older adults are the biggest users and abusers. An article in JAMA Psychiatry found Medicare beneficiaries had the highest and most rapidly growing rate of “opioid use disorder.” Six out of every 1,000 Medicare recipients struggle with the condition, compared with one out of every 1,000 patients covered through commercial insurance plans. According to the study, more than 300,000 Medicare recipients battle with opioid use disorder, and hospitalizations due to complications caused by opioid abuse or misuse increased 10 percent every year from 1993 to 2012. Efforts are being made to check this crisis. In recent years, states have instituted laws that monitor people’s medication use to ensure they are not getting more drugs than their doctor prescribed. The state of Washington, for example, has a website that a pharmacy or doctor can check to make sure a patient isn’t acquiring medications from more than one pharmacy. If so, they may limit patients’ doses, prescribe fewer pills or cut them off altogether. Older adults have more pain, in general, and rely on opioids to relieve the pain. In fact, chronic pain is cited as the main reason for taking opioids, compared to younger people, who may take them for relaxation. Seniors have more issues with memory, so they are more liable to forget they took a dose and retake it. For certain medications, that can be fatal. Falls are more likely for seniors on opioids, significantly raising their risk for potentially serious fractures. 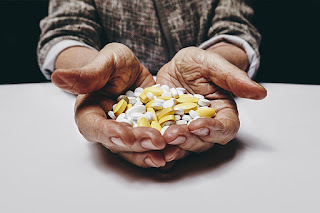 Seniors take more prescription medications, as well as over-the-counter drugs, than other age groups—consuming one-third of all prescription drugs in this country. In addition, because most older adults take more than one medication, the risk of harmful interactions is high. Diagnosing addiction is more difficult because seniors have medical issues, such as fatigue or confusion, which can hide the symptoms of addiction. As we age our liver function decreases, and it can be harder to filter medicines from our bodies. Because we metabolize synthetic drugs at different rates, some seniors can become addicted or overdose easily. Alcohol abuse is a serious problem among seniors, thereby raising the risk for a sometimes deadly combination of alcohol and painkillers. For conditions such as spinal stenosis, surgery is not an option for some elderly, because of the risks, so painkillers are the only solution. At first, physicians prescribed opioids primarily for short-term relief immediately after surgery or an accident. But increasingly, the drugs are being used for long-term chronic pain. Unfortunately, there are not a lot of good alternatives to ease acute pain, especially for older adults. Under Medicare Part D, the only effective drug therapy for opioid use disorder is buprenorphine-naloxone, but few doctors prescribe it because of cumbersome government regulations, including having to take an eight-hour class. In 2013, according to JAMA Psychiatry, doctors wrote far fewer prescriptions for buprenorphine-naloxone than for opioids. A non-prescription medication, acetaminophen has been shown to work with opioids, so patients can use less of the opioid. The active ingredient in Tylenol, acetaminophen, can also be combined with nonsteroidal anti-inflammatory drugs (NSAIDs), such as ibuprofen, making opioids more effective. However, patients often need to limit use of over-the-counter drugs like Tylenol and Advil. Too large a dose over a period of time can cause long-term problems, especially in older adults, such as liver or kidney damage. It’s a common scenario: Someone checks into a hospital for surgery or an illness and leaves with a prescription for an opioid painkiller, opening the door to long-term use and dependence. A recent study examined this pattern and found the prescriptions are used and renewed more often than you might imagine. Researchers analyzed the pharmacy claims of a random sample of more than 623,000 Medicare beneficiaries who were hospitalized in 2011. They only included people who did not have a prescription claim for opioids for at least 60 days before being hospitalized. The results, first published online in JAMA Internal Medicine in June, showed that 14.9 percent of the hospitalized beneficiaries filled a prescription for an opioid within a week after being discharged. Of those who filled the first prescription, 42.5 percent had another pharmacy claim for an opioid painkiller at least 90 days later. “Presumably, they were prescribed it and continued on it because of some sort of chronic pain,” said Dr. Anupam Jena, associate professor of health care policy at Harvard Medical School and the study’s lead author. Still, there are many ways to treat pain, Jena noted, and hospitals are supposed to look at other approaches. Source: Reprinted from “Despite Opioid Concerns, Seniors Often Exit the Hospital With Prescription: Study,” July 15, 2016, Kaiser Health News. Anti-depressants inhibit serotonin, which transmits signals between nerve cells in the brain, and can lessen nerve pain. Muscle relaxants can relieve muscle spasms and low-back pain. Radiofrequency ablation decreases pain signals, especially from ailments such as arthritis. This technique places a needle close to the nerve that is sending pain signals to your brain and then sends an electrical current through the needle. Anticonvulsants, which primarily treat epilepsy, can also soothe neuropathic pain, migraine headaches and fibromyalgia by suppressing the flow of pain signals from the brain. Steroids, such as prednisone, ease inflammation, but the pain returns once you stop getting the shots, and steroids have serious side effects. Other injections for pain include nerve and epidural. Massage, acupuncture and other alternative therapies can be combined with other treatments to lessen the use of opioids, although studies of their effectiveness for pain management are scarce. Also, health insurance rarely covers alternative treatments. People who visit hospital emergency rooms come mainly because of severe pain, so hospitals tend to be the starting point for those who become addicted to opioids. However, one hospital, St. Joseph’s Regional Medical Center in Paterson, N.J., has opted to take a different route. Instead of treating patients who come in for migraine or kidney stone pain, for example, with opioids, the emergency department, one of the country’s busiest, has provided alternatives that include nonnarcotic infusions and injections, ultrasound guided nerve blocks, laughing gas, “energy healing” and a harpist, according to the New York Times. “Silent Epidemic: Seniors and Addiction,” Dec. 2, 2015, U.S. News. “‘Astounding’ number of opioids prescribed to elderly, report finds,” June 22, 2016, Stat News. “Seniors and Prescription Drug Addiction,” June 9, 2016, Aging Care. “Older Addicts Squeezed by Opioid Epidemic” July 26, 2016, Pew Charitable Trusts. “Use of Opioid Agonist Therapy for Medicare Patients in 2013,” JSeptember 2016, JAMA Psychiatry. “Trends in older adult nonmedical prescription drug use prevalence: Results from the 2002-2003 and 2012-2013 National Survey on Drug Use and Health,” September 2016, Pub Med.gov. “The Quiet Epidemic of Senior Drug Abuse,” Jan. 22, 2014, A Place for Mom. “Study: Medicare Beneficiaries May Face ‘Treatment Gap’ For Painkiller Abuse, Misuse,” July 20, 2016, Kaiser Health News. “A growing number of people 50+ are abusing prescription painkillers, sometimes with fatal consequences,” June 2016, AARP Bulletin. “Prescription Drug Abuse in the Elderly,” Family Doctor. “Opioid-Free Ways to Live Well With Chronic Pain,” Everyday Health. “Chronic Pain Relief: New Treatments,” WebMd.